2 years & up. 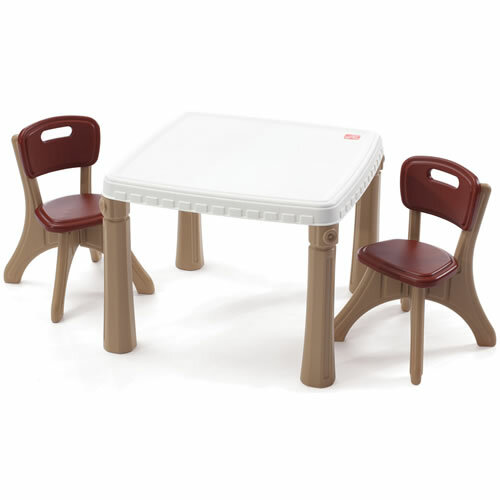 Tthree-piece table and chair set is great for any child's room or playroom. The set includes 1 table and 2 chairs with unique 'X' design legs. Constructed of sturdy plastic that ensures years of functional use. Chair holds maximum of 50 lbs. Minor assembly. Table size is 19"H x 27"W. Seat is 11" high. I was expecting sturdy legs on table, these are flimsy will never last if you have children who will use it often. I have 4 toddler's The 16 month old can lift the table its so light weight. Thank you for taking the time to review our product. We're sorry to hear the products you ordered didn't meet your expectations. If you haven't already, please contact our customer service department at 1-800-334-2014 for assistance.